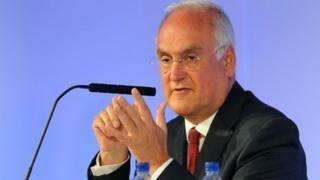 Ofsted chief Sir Michael Wilshaw has said head teachers faced with equal candidates for a teaching post should consider "positive discrimination". The head of the education watchdog told LBC Radio that the teaching staff of schools should reflect the ethnic diversity of their pupils. "There needs to be a fair representation," said Sir Michael. But the government said positive discrimination was "not permitted" under equality legislation. Sir Michael said if the "ethnic mix" of pupils is very diverse, "it's important to have a staff which reflects that". "Every head teacher I have ever met wants the best person, best qualified person, best communicator in front of children and will put that as the first priority in appointing staff. "I have always worked in inner-city environments with youngsters from different ethnic backgrounds and always felt it was important to try and get a staff mix in that sort of environment. "If I had two people applying for a job of equal merit and I felt we needed to increase the number of teachers from ethnic minority backgrounds to the staff then I would apply positive discrimination - as long as the two people were of equal merit." But the Department for Education said that schools had to abide by equality legislation when appointing new members of staff. This meant that "positive discrimination is not permitted". "However, schools, like any other employer, may take positive action to address under-representation of any particular group of persons who share a protected characteristic." According to the Equality and Human Rights Commission, "positive action" means an employer can encourage people from under-represented groups to apply for jobs. But it also says that it can be used in "tie-break" decisions when an employer has "a choice between two candidates who are as qualified as each other". Sir Michael also rejected the idea that promoting tolerance for other faiths prevented schools from holding Christian celebrations such as nativity plays at Christmas. "All schools, no matter whether they are faith or non-faith schools should celebrate Christmas as a great Christian festival, with a nativity play or what they wish to do," Sir Michael said. "They should talk about the importance of Christmas, particularly in a country which is still largely Christian. "But there are other faiths living in this country who will celebrate their particular celebrations and schools should recognise that and talk about it."